Using roses in your landscape and gardens is easier than ever. There is a rose for every purpose. By now you know that new varieties of roses make it possible for even beginning gardeners to grow beautiful roses. But many gardeners have a hard time thinking of roses beyond traditional rose gardens and cottage gardens. Truly, there is a rose for every purpose. Just be sure to carefully define your purpose, then narrow down the roses that will fill your needs. The trap so many of us fall into is getting wooed by all the beautiful roses out there. We may find a rose that will look perfect in our plan, but requires more maintenance, or sun, or shelter than the planting site can provide. Believing that we can coax the rose into thriving is a mistake, creating extra work that may not even help. Hardiness - do you have the time and interest to protect tender roses? Tolerance of your soil conditions - are you willing to amend your soil deeply to accomodate a favored rose? Are you willing to commit to a regular spraying schedule or will you need highly disease resistant plants? Can you consistently feed and compost “heavy feeder” or do you need feed once in spring shrub roses? Will you religiously prune in spring? 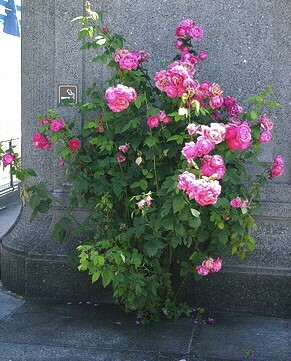 Many shrub roses require little or no pruning. How much water? Be sure the watering requirements of plants in a mixed bed are similar. Bloom early or late? or repeatedly? or continuous? Now find the roses that are suited to your specific need. Narrow down your selections by appearance and color. But first things first! Here are some ideas about how to use roses all over your property! Create a lovely and fragrant entry garden with shrub roses, perfect for welcoming. Double Pink Knockout roses, Sky Pencil holly, and Evergreen candytuft. When you are agonizing over finding the perfect spot for your rose, remember - roses are tough! This one is growing out of a crack in the sidewalk! There are endless ideas for using roses in your landscape and gardens. Plant them where you can enjoy them most. Choose fragrant varieties near patios, garden walks and entry areas. Choose everblooming and easy care shrub roses in more distant areas of your property.